For those who pay attention to the Virginia Wine scene, this is already old news, but for those of you who don't, last night Paradise Springs Winery was awarded the 2010 Governor's Cup for their 2009 Chardonnay Reserve! That is the white wine version. 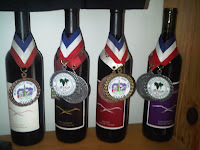 (The red wine version was awarded to King Family Vineyards for their 2007 Meritage last winter.) This is a notable achievement for Paradise Springs, not only because they are such a young winery, and because it the first time since 1991 that a Chardonnay has won the award, but more importantly its redemption for the painful process they endured when opening the winery. We will let them re-tell that story or read about our previous visit here. Congratulations to Ms. Knicheloe, Kirk, and the rest of the crew. The House Judiciary Committee responsible for voting on the anti-consumer, anti-winery HR5034 occurs today. You can watch live here (RealPlayer), or check out the Twitter feeds for #5034. Check out this article on the state of New Jersey wineries. Apparently they are flourishing; time to head to the Garden State. Jack Tomasello checks Cabernet Sauvignon grapes Sept. 8 at Tomasello Winery in Hammonton. A new wine social networking site called, Wine Club Zone, has just launched. By registering with the site you can keep informed of activities in your region, rate wine clubs, and view various blog postings. This site is the first we are aware that allows users to rate wine clubs - not a bad option considering the amount of money people spend at these sources. Next door at MyJoogTV, we just released Episode 4 which features the band soihadto in a discussion of beer and music while sipping beer from Brewer's Art. Never heard of soihadto? For you Foodies over at FoodBuzz, this band includes Chef Duff from Charm City Cakes and the Food Network's Ace of Cakes. However, the band is just not Duff; it includes several talented musicians that play a blend of funky, jamming, psychedelic, rock - whatever that is. Nevertheless, its music worth listening to - and Resurrection Ale merely enhances the sound and doesn't compensate for it (watch the intro). During the episode we discussed beer, Baltimore, touring, and much more. The video is available at MyJoogTV or by download at Tunes and for Windows Media Player. So says the title to this article regarding the proposed privatization of state liquor stores. But do they? Privatization was a major campaign plank for Governor Bob McDonnell (R) and he hopes to generate anywhere between $300 million and $500 million for the state’s transportation coffers. Now the Governor and First Lady have been outspoken advocates for Virginia wineries, so it is reasonable to conjecture that the The Virginia Wineries Association endorsement of the plan was a political decision rather than a decision on whether the plan actually benefits its members. On the contrary, I would suggest that individual wineries would prefer stability over the instability caused by privatization - particularly when privatization enhances the power of the - already too powerful - wholesalers oligopoly. 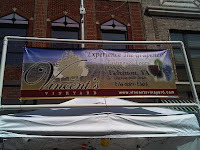 In addition state liquor stores may be the only retail outlets (beyond the tasting room) for some Virginia wineries; now these wineries will have to rely on the three tiered market. Now we at the libertarian WineCompass would normally endorse a decline in government's role in private industry; but not in this instance, when the government is simply transferring power to a government created oligopoly. And with HR 5034 resurfacing, the wholesalers may get even more powerful. For those like us who couldn't attend the 2010 Great American Beer Festival, here is the list of winners. A special shout out goes to two Nelson County breweries we plan on touring for MyJoogTV during The Festy - held October 9th-10th. Blue Mountain Brewery (Afton, VA) was awarded a Gold in the American-Style Wheat Beer category for their Sandy Bottom and a Bronze in the German-Style Kölsch category for their Kölsch151. Neighboring Devils Backbone Brewing Co. (Roseland, VA) was awarded a Gold in the Coffee Flavored Beer category for their Baltic Coffee; another Gold in the American-Style or International-Style Pilsener for their Gold Leaf Lager; a Bronze in the English-Style Mild Ale category for their Ale of Fergus; and a second Bronze in the South German-Style Hefeweizen for their Wintergreen Weiss. Now that's a showing. Can't wait to try these beers next month. 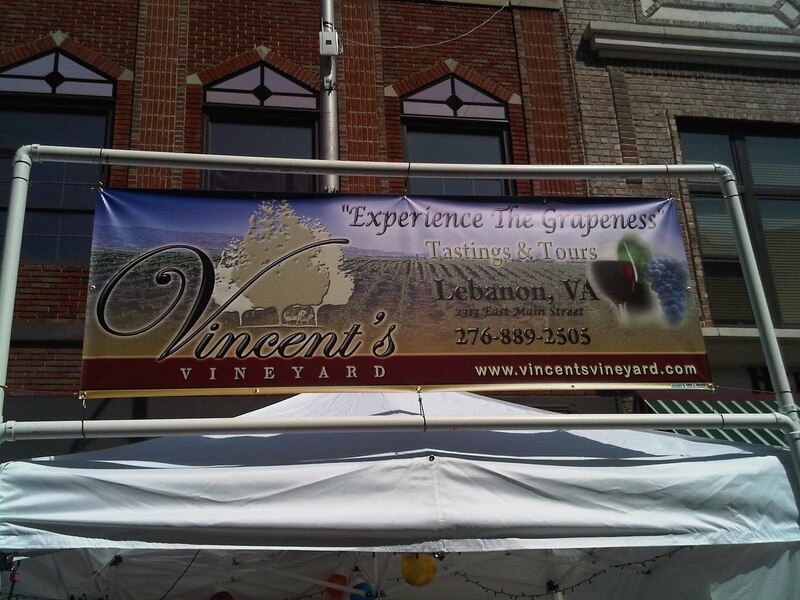 While attending the Bristol Rhythm and Roots Reunion, I noticed one winery present among the various craft vendors: in Vincent's Vineyard from Lebanon Virginia. The vineyard is located on a 6 generation family farm that previously cultivated tobacco. In 2001 vines were planted (mostly hybrids, Traminette, Chardonel, Chambourcin) and the fruit sold to neighboring wineries. In 2008, a winery was constructed and completed so that the estate fruits could now be converted to wine on the premise. In Bristol, their booth was usually busy as festival goers wither sampled the wines or lounged in recliners after purchasing a bottle. We started with the 2009 Cabernet Franc - yes a very young wine, but one they wanted to get out early. It was a little light, but had enough cherry flavor to make it drinkable. And for fruit grown in that location, it probably is a very good wine. The hybrids are the winery's strength. The Angler's Choice is an off-dry wine made from Chardonel. It is flavorful,which isn't the case with most wines made from this grape. The Traminette was even nicer, slightly spicy but with even more fruit flavor. This may have been my favorite. Even though its made semi-sweet, you can't really tell. You can tell with the semi-sweet, Chambourcin based Make Me Blush. Lots of cherry flavor, but too sweet for my taste. The sweetest wines are the Shepherd's Red and Shepherd's White. The later is a blend of Chardonel and Vidal, while the red is pure Chambourcin. And that one was quite good - not over the top sweet. For a young winery and for making wines to fit a sweeter palette, these were decent wines. And nice to see them in Bristol. 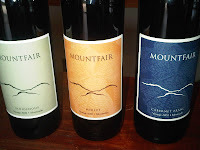 Our friend Dezel, from My \Vine Spot has been touting Mountfair Vineyards for a year now so we finally took his advice and visited the winery during a trip to Afton. The drive to the winery was quite interesting as we bailed out of route 29 and took the back roads from Madison, twisting and turning along country roads, past pastures, and the Walton Homestead, and into north Crozet. It was construction day as the staff was building and painting a patio for special nuptials planned for next week. But fortunately they had time for visitors. 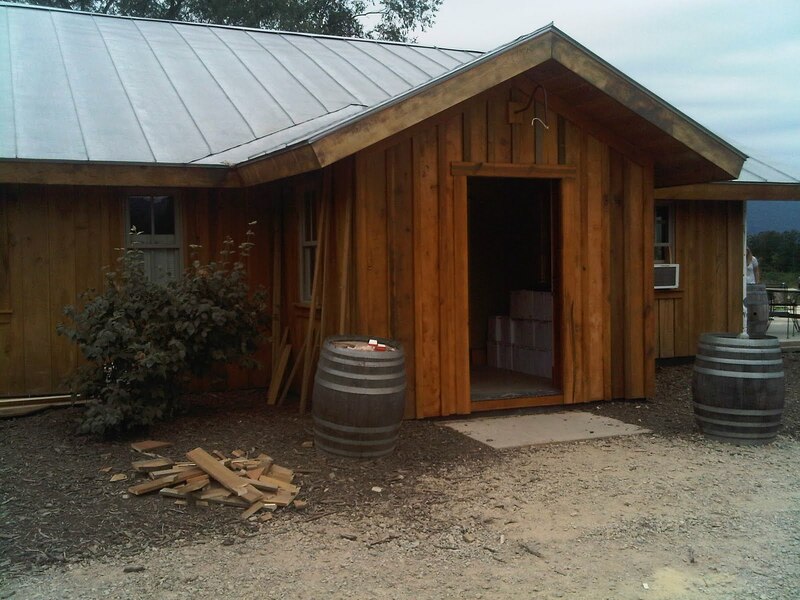 The winery and tasting room at Mountfair are located in an old horse barn, adjacent to a row of Tannat. 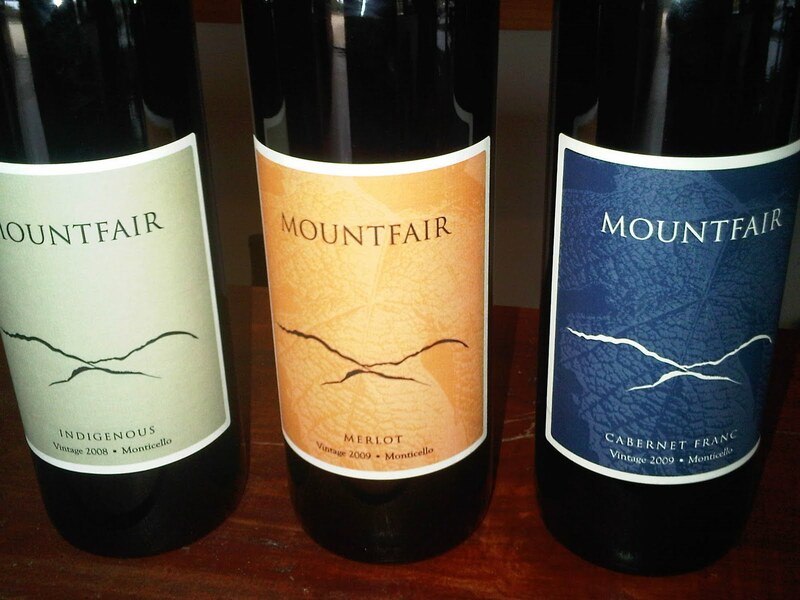 The Blue Ridge Mountains are clearly visible, not only from behind the winery but on the wine's label. The estate vineyards are planted with classic Bordeaux varieties as are the other fruit they source. For this winery makes wine not only just from these grape varieties, but only red wines from the classics. And excluding a soon to be released series, the wines are classic blends. In honor of next weekend, we started with the 2008 Engagement - a blend of 65% Merlot, 25% Cabernet Franc, and 10% Petit Verdot aged in neutral oak. This is an easy drinking wine - smooth and fruity. The interestingly named Wooloomooloo 2008 was next and this Petit Verdot dominate wine is a much bigger wine, from the nose to the tail. Yea, its also aged a little longer, but even with the extra tannins, its still relatively smooth. Two nice Bordeaux blends, Dezel is right - this is what makes wines from the Monticello AVA so appealing. Being in the trade, they graciously brought out three upcoming releases. The 2008 Indigenous is a 50-50 blend of Cabernet Franc/Petit Verdot harvested from the estate. This is a special wine, only 75 cases available, and believe me, they will go fast. Even with the bottle shock, this is already a delicious wine - give it a couple months - and..... - buy it now. The final two are single varietals (Cabernet Franc and Merlot) especially made for the restaurant market but will be available at the winery - think UVA tailgates. The wines are prices slightly lower than the blends and, are actually blends themselves (80-20) - although state law allows then to be designated single varietal. 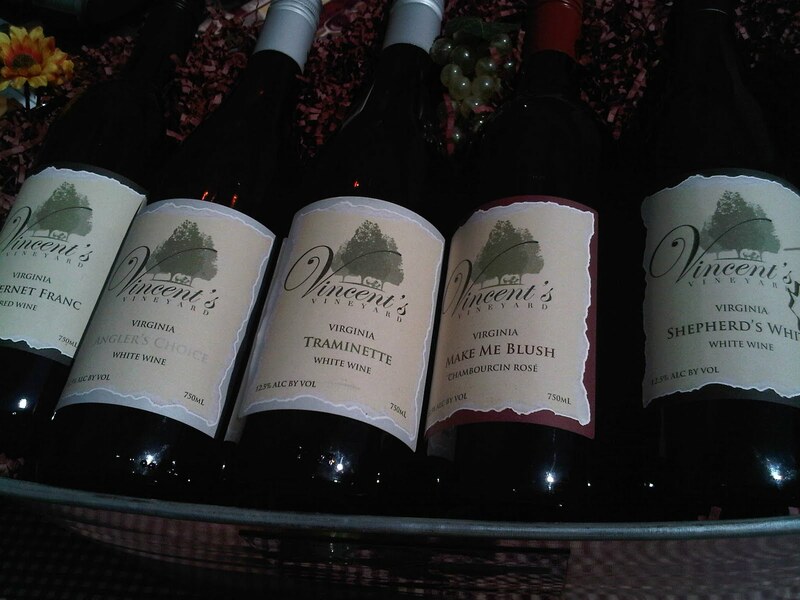 These are nice wines, obviously not as complex as the other brands - but still good wines. This entire portfolio and the easy going style of the team makes this a destination worth the crazy drive. Actually, if one starts from Charlottesville, the drive is quite easy - just be prepared for a slow trek coming from the north. By either direction, we will return. 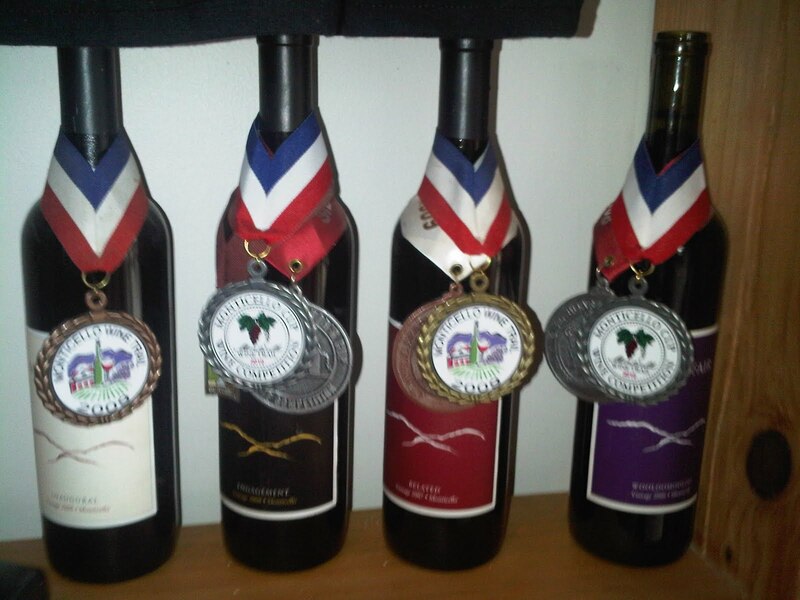 The Maryland Wineries Association just released the results of the 2010 Maryland Governor's Cup Competition with the cup going to Fiore Winery for their Sangiovese 2007. Plus their apple wine must be pretty good. Congratulations. The official presentation will occur during The 27th Anniversary Maryland Wine Festival®, September 18-19 at the Carroll County Farm Museum, Westminster, Maryland.